evilkorova.com: Coyote Creek Parkway: Uphill both ways. Coyote Creek Parkway: Uphill both ways. 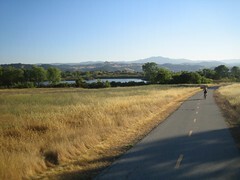 In an effort to get out during the week, we attempted the Coyote Creek trail after work last night. This time we went a total of 25.5 miles. Still 5 miles (round trip) short of the end, but we had to make it back by sunset. The return trip should have been a slight downhill but with a head wind it actually took off almost 2 mph, making it feel as if it was uphill in both directions. It's a nice parkway with lots of shade. The new parts for us were mostly in old ranch land and preserved areas and very pretty. There are even rest stops along the way. We made use of one just after turning around so we could get a bite to eat. The only thing that would make this trail better is if it was single track :).